This is a very unique watch, insomuch that it was paid for by you, the readers of watches.cyberphreak.com! The small ads you see on the side and bottom of the page generated enough cash to fund the purchase of this watch, so, a big Thank You, to all you kind followers out there. Now, off to the watch. This is a Seiko 5 Sports, a SRP273K1. This watch is my second with Seiko’s new line-up of entry level automatic movements, the 24 jewel 4R36A. While the 7S26/36 is a solid movement, it lacks hand winding and hacking, both of which the 4R35/36 provide. The 4R35 has date only, the 36 has day and date. While what is on the inside is important, it is what is on the outside that you notice. The dial of this watch is deep black, with lime green markings. The contrast is very deep and makes the watch very easy to read. The hour markers are Arabic numerals, with the 12 and 6 O’clock markers larger for easier time telling. All hour markers have a luminous dot between the marker and the chapter ring. The chapter ring has a lot going on. There is a 24 hours scale, in addition to second markings, and finally, 1/6 of a second markings to match with the long seconds hand. The dial is quite verbose, with Seiko, the 5 shield, Sports, Automatic 24 jewels, 100M and a box around the day and date window. The hour and minute hands are large, Skelettform, filled with luminous material. They are, thankfully, appropriately long. The hour hand extends to the hour makers, and the minute hand extends all the way to the chapter ring. The seconds hand is a simple stick with a large, circular, luminous tail. It also extends to the chapter ring. That is one thing I really like about Seiko watches, nearly all of them have correctly proportioned hands to the dial. For the day and date, the day of the week dial is black, and the day dial is white. This is a nice touch, since there is no hour maker at the 3 O’clock position. The hands are well filled with LumiBrite and glow for several hours, even exposed to just indoor lighting. Not as well as my Diver’s, but good enough for most people. The case is a pleasingly modern 39.5mm in diameter, stainless steel. It actually wears larger than 39.5mm. The top and bezel are brushed, the sides are polished. The crystal is Hardlex and flat. Glare is rarely a problem with Seiko’s Hardlex, even with flat crystals. The bezel makes the watch wear bigger than it actually is. The crown is unsigned, but very large and easy to wind. This is important since you can hand wind this watch. I think my largest complaint with my Omega is that is is pretty hard to wind, especially compared to this Seiko, which cost a twentieth the price. The lugs are 20mm and are drilled through, to make for easy band changes. The case back is an exhibition, Hardlex and polished stainless steel. 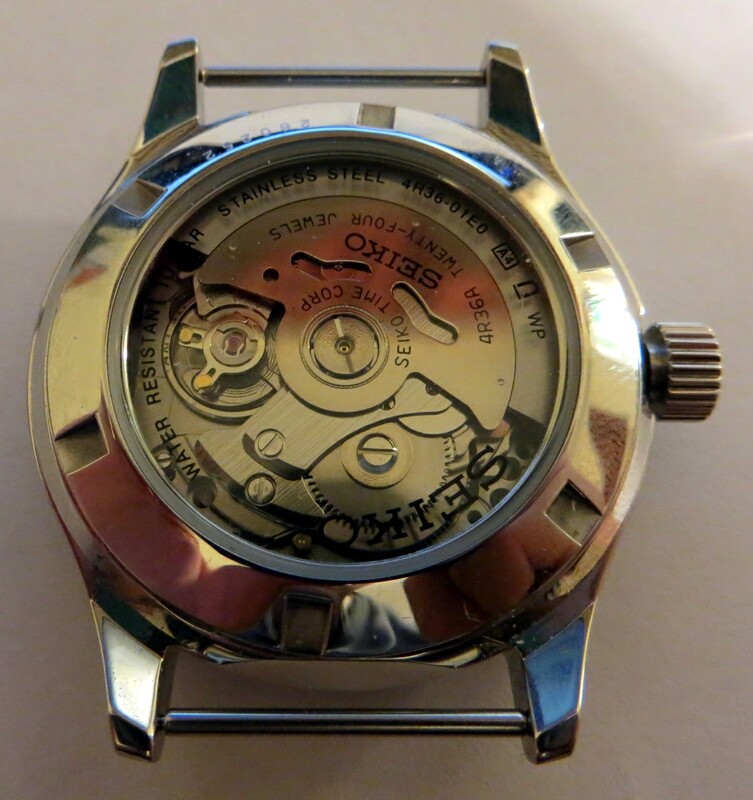 It shows the latest entry level automatic movement from Seiko, the 4R36. It is simply, but well finished with laser sharp markings. It appears to have a bit more polished parts and finer finishing on the bridges, as compared to the 7S26/36. The 24 jewel movement keeps good time with a 40+ hour power reserve when fully wound. Hacking and hand winding are standard now. This particular watch is running a little fast, about 20 seconds a day, but I am sure it will settle down after a few more months. Seiko tends to set the timing a little fast from the factory since they know when the movement breaks in, it will slow down a little. In this view, you can see the large, deeply knurled crown as well. Finally, we have the 3 ring, Zulu, nylon band. The rings and buckle are stainless steel and highly polished. 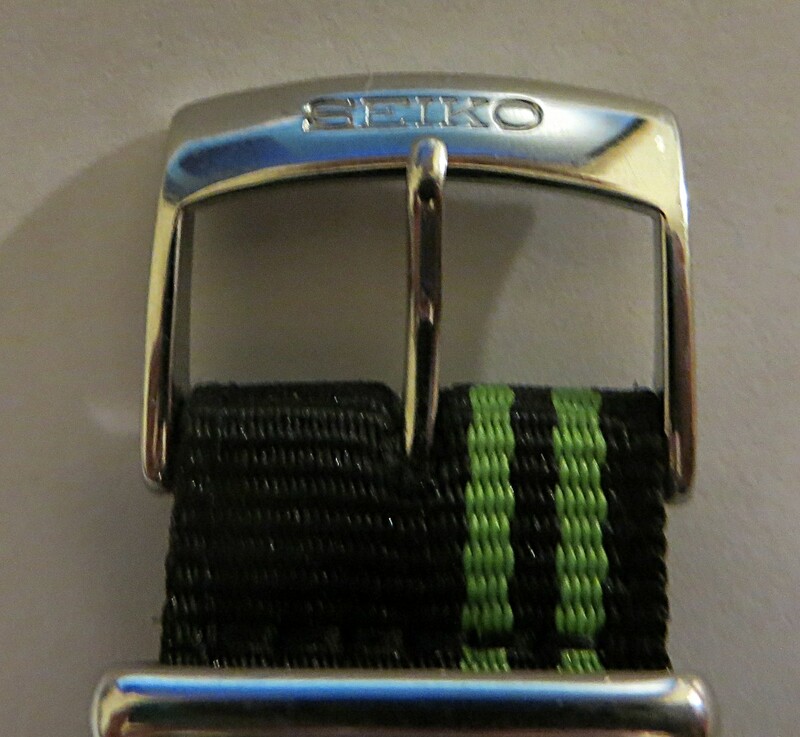 The buckle is signed Seiko. 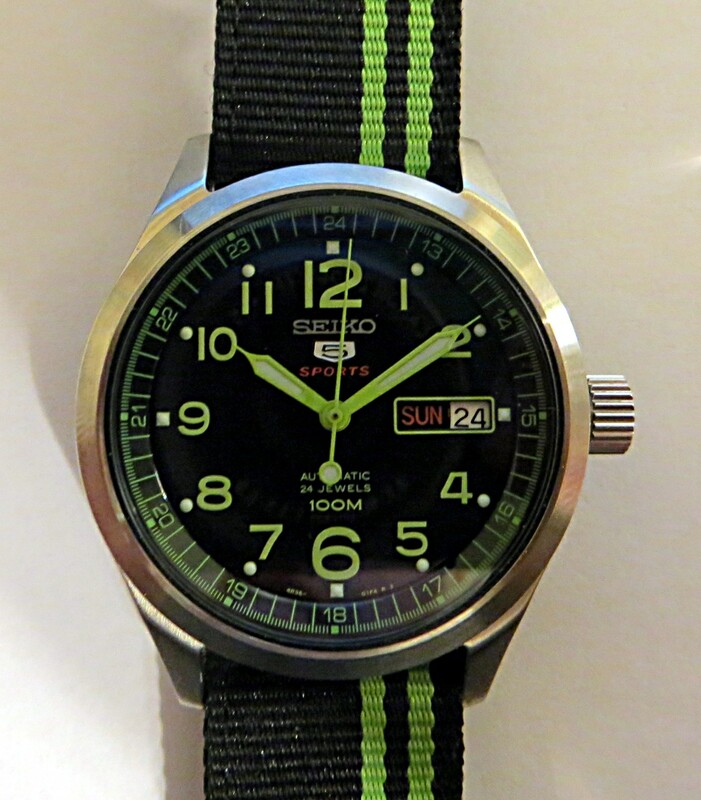 The green stripe perfectly matches the green markers and hands of the watch. The black matches the dial. It is also the thickest nylon band I have ever seen. Seriously, it makes makes every after market band I have seen look like a joke. It is 20mm the whole length. This watch is a great sports watch, true to its name. It is easy to read in all lighting conditions, and is a nice, modern size without being overwhelming for smaller wrists. The watch feels like a quality piece, with the small touches like the band being perfectly matched to the dial of the watch. The movement upgrade from the previous generation of Seiko 5 Sports is very welcome, and did not significantly increase the price of the watches with this new line of movements. It has received a lot of wrist time over the past few months and pairs well with casual clothing. A dress watch, this is not. See this review for it’s dressier brother. I am very happy wearing this watch and recommend it to anyone looking for a field/military style watch. Case: 39.5 mm diameter, 13mm thick, Stainless Steel. 100M water resistance. Back: Hardlex display, screw down. Movement: SEIKO 4R36, 24 jewel automatic, hand winds and hacks. 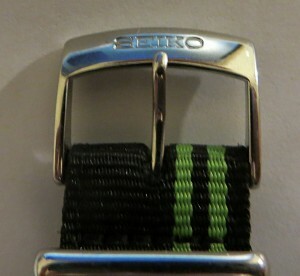 Other: On Seiko Zulu nylon heavy duty strap.